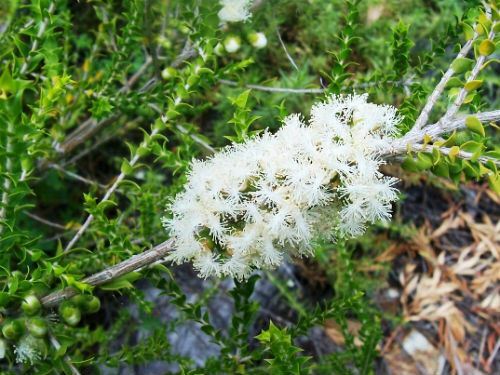 Melaleuca cardiophylla is known as the Umbrella Bush and is a small to medium shrub with intertwined branches. Tiny stem-clasping leaves are heart shaped (hence the species name). White flowers are carried in small clusters along the branches. They have five individual spreading bundles of stamens (see thumbnail). This flower arrangement is similar in appearance to those of the better known M. thymifolia. The flowering period is variable but occurs between October and February. The specimen illustrated flowered in mid-January. Large globular fruits follow the flowers. Pruning after flowering is recommended to keep plants from becoming straggly. The specimen, in our cold climate garden, is about ten years old. The Umbrella Bush has proved to be very hardy and free-flowering. M. cardiophylla could be cultivated in shrubberies and informal hedges. The species is a native of the south-west area of Western Australia.